The UK’s decision to leave the EU presents both risks and opportunities. While there is the potential to create value for all parties concerned, it is also possible to have the opposite effect and exacerbate division if handled incorrectly. We follow a methodology based upon proven, standard negotiation techniques. The first step for any negotiation is to develop a thorough understanding of the issues at stake, considering the concerns of all involved. It is critical that we do not bargain over positions - true value is only created when the parties understand the interests behind these issues. 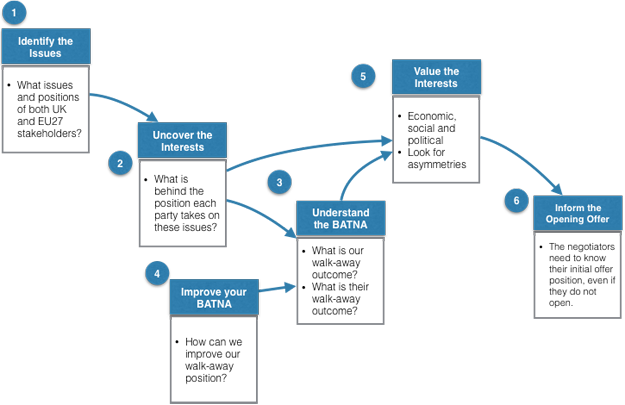 Negotiators need to uncover the (relative) value and importance of these interests to each party. This can only be accurately done once the “best alternative to a negotiated agreement” (or BATNA) for each side is fully understood. i.e. what will we do if no agreement is reached? A negotiating hand should also be strengthened by improving the BATNA wherever possible. The Forum will support the negotiation process through the development of evidence-based, neutral research within this framework; hosting seminars to establish consensus of the value and importance of key issues and interests; identify opportunities to create value with our EU partners; and understand and enhance our BATNA. The Forum will engage with a wide range of stakeholders, including those in the EU, to better understand their issues and concerns and evaluate the potential for consensus. The Forum recognises the importance of sustaining a positive, long-term relationship with the EU alongside new arrangements with non-EU countries. 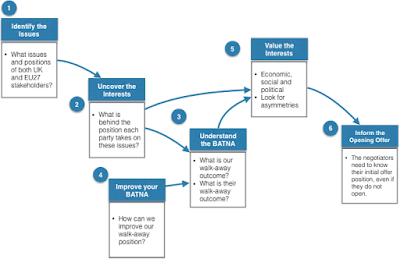 Our framework is based upon established negotiation methodology and is designed to address each critical step in turn. In parallel, analysis is required to map out the rules and influencers of the negotiation. For example, any agreements made under Article 50 require only Qualified Majority Voting (QMV) and so could be passed by, for example, Germany, France, Italy, Poland and 11 of the others (with the consent of the European Parliament). However, anything negotiated outside of Article 50 would need a unanimous agreement. Another variable comes from the election cycle, with potentially sixteen of the EU states facing government elections over the next two years. Understanding the interests of all stakeholders is therefore paramount.